The March meeting was held at Jack Putnam's with 11 members and guests in attendance. Bob Torbet led the meeting. We all introduced ourselves to the new members and ran through the past and upcoming events. Jack gave a treasurer's report and a report on membership which is down from last year. It was decided to have a spring shakedown tour on April 30th from Jack's with a possible lunch destination in Ottawa. The Bluffton car show was mentioned along with the Marion street festival on June 25th and a Bucyrus show for Model A's and T's. Also remember the Backstreet Festival at the Hancock County Museum on August 20th. In Jamboree news, the Tickin' T's of Central Ohio will be hosting the 23rd Annual Ohio Model T Jamboree centered out of Marysville, Ohio. The host hotel will be the Hampton Inn (937-642-3777). The overflow hotel is the Comfort Inn (937-644-0400). Please, mention the Model T Jamboree when making your reservations. Camping will be at the Union County Fairgrounds. Reservation for camping will be through the tour sign-up. Letters with all of the information will go out in May. 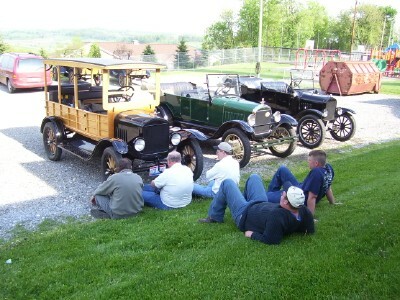 While we're talking about upcoming events, Sauder Village in Archbold, Ohio will be hosting their annual Antique Car Show on May 13th and 14th. 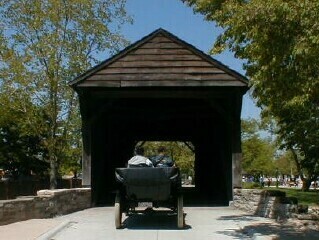 Antique cars made prior to and including 1942 will be permitted. The coil doctor demonstration by Brent Mize and a line boring demonstration by Joe Bell was to be held at one of the Toledo Ford dealers in March. Brent has taken the help of Ron Patterson and run with it. It sounds like everyone had a good time. The Tickin' T's of Central Ohio are trying to do a "Back to Basics" tour this year. The hope is that other groups will see how easy it can be. This should promote the desire to step up and take a turn at the Jamboree for next year. Click on the Jamboree logo to go to Brent's page where the committee is keeping the Jamboree information. Shakedown tours give us a chance to get the T's out and put them through their paces. We find out if those new tubes will take the pounding of a road tour. We get to see a lot of Ohio. 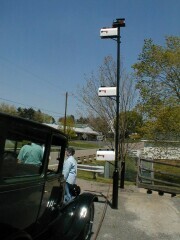 There are lots of sites to see and the cars are just part of the adventure. The more you drive them, the better they run. Sometimes its good to get out of the car and just enjoy a rest in the grass. I think that the wives were in a junk store. A buzz around Indian Lake is always a joy. Its a chance to see how the other half lives. For some people, these are vacation homes. We didn't even charge the community for the road oiling. We will miss the Tilton Hilton. We will travel to new places and have new experiences.